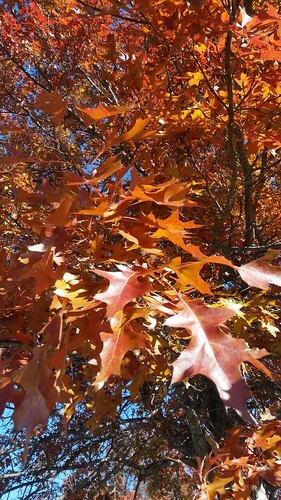 Orange and brown leafs on a tree in fall. I know, I know! It's fall--we've already seen all these trees with their leaf-changing colors and now that October's over, we're hunkering down for Turkey Day and Xmas and get over the fall leaves stuff. Yet as I was out for a walk, this particularly called out to me--hell, it reach out to me with this branch, calling for my attention. The photo doesn't capture it well but this branch seemed to be looking for someone to come along and give it a high-five; I did the next best thing, I took a photo of it.